I’m a sucker for movies that question the sanity of the main character and thereby cause the viewer to wonder about the reliability of the narrative. Such films, if made right, can offer a wild ride. 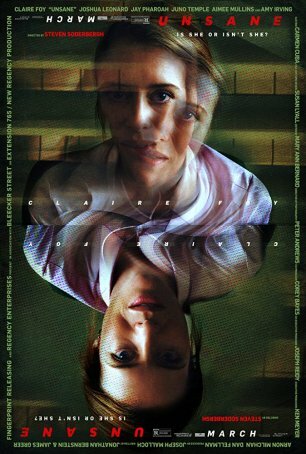 Unsane, Steven Soderbergh’s second post-“retirement” movie (following Logan Lucky) offers such an experience. Although the ending is generic and needlessly protracted, the production as a whole is suspenseful – full of diabolical little twists as it ventures deep into an uncomfortable territory using the trail blazed by Misery. For Soderbergh, it’s not longer just about making a movie; it’s about doing something interesting. He’s arguably the most budget-conscious big-name director working today and his release model, handled in conjunction with partner Bleecker Street Releasing, doesn’t follow the traditional “carpet bombing” method of advertising. Unsane was filmed using an iPhone (the 7 Plus, to be precise). Although the resulting images might not be suitable for a conventional film, the occasional distortion around the edges, the unusual aspect ratio, and the odd shot composition work perfectly for a story in which the sanity of the protagonist is in question. The director (who also shoots and edits his own work, albeit pseudonymously) also avoids employing any big-name stars (who come with big-name salaries), with the exception of one recognizable cameo. Claire Foy plays Sawyer Valentini, a thirtysomething woman who is starting a new job in a new city. She’s already receiving rave reviews for her work and an offer from a lecherous boss to accompany him on a trip to a conference. But, despite her employment success, all is not well with Sawyer. On a hookup-gone-wrong, we learn that she has…issues. She’s prone to hallucinations and, as she confesses to a psychiatrist, she’s suffering from a form of PTSD related to a stalker incident. Now, she sees the man, an obsessive named David Strine (Joshua Leonard), everywhere. An offhand comment makes the therapist believe she could be suicidal. She is presented with a sheaf of papers (“all routine”) that she foolishly signs without reading, thereby acquiescing to a 24-hour period of voluntary commitment, where a violent outburst turns one day into seven. Inside, she finds a friend in Nate (Jay Pharoah) and an enemy in Violet (Juno Temple). Her mother (Angela Valentini) works tirelessly to achieve her daughter’s release. But Sawyer soon realizes she may have bigger problems than laying low and taking her meds when she recognizes one of her caretakers as her stalker, David Strine. But is he there or is she imagining him? Soderbergh enjoys keeping us guessing and the odd cinematography resulting from the iPhone enhances our uncertainty about everything we’re seeing through Sawyer’s perspective. This isn’t Limbo, however. The movie doesn’t take us on a journey into ambiguity and leave us stranded there in a state of perpetual frustration. There’s a clear resolution to the question of Sawyer’s sanity. The filmmaker doesn’t want to alienate viewers. We’re not talking about another mother! here, although there’s considerably more artistry evident in this production than in the typical horror/thriller. To a large extent, the success of Unsane relies on the performance of Claire Foy (best known for her portrayal of Queen Elizabeth II in “The Crown”), who is in nearly every scene. Foy displays astounding range – from the quiet depression of a woman trying to reclaim her life to the intensity of someone gathering the fragments of her sanity. In between, there are bouts of hysteria and scenes in which Sawyer gives off the vibe of someone unhinged trying to pretend to be normal. Soderbergh and Foy work to keep us off balance. Unsane’s bare-bones approach to the genre would probably earn the approval of Blumhouse, the horror factory known for preaching this doctrine: low grosses are only problematic if budgets are high. Soderbergh’s first foray into horror generally takes a high road, focusing neither on gore nor a high body count. Like Hitchcock in Psycho, this is more about slow-building terror and suspense than jump-scares and careless violence. If the movie’s ending underwhelms due to the banality of the resolution, that’s one of the few aspects of Unsane that disappoints in this edgy, captivating motion picture.